Read about the latest & greatest on djay. We are excited to announce the release of djay 2 for iPhone and iPad optimized for iOS 7, adding fresh UI elements, enhanced audio features, and exclusive “Artist Packs”. The new modern design elements of iOS 7 integrate beautifully with the existing interface making this the most polished version of djay ever. Leveraging the new Inter-App Audio in iOS 7, djay 2 can now easily connect with other audio apps. With “Artist Packs” we have added collections of 12 exclusive samples that can be loaded to the integrated drum pad sampler. As innovators and trendsetters in the music industry, prolific artist Snoop Dogg and scratch master DJ Qbert are the first artists to have exclusive sound packs included into djay 2. In addition to the “Artist Packs,” djay 2 also introduces an exclusive "Skratch Tools” feature, a collection of unique Qbert sounds that users can load onto the deck to scratch. This update is free to all existing users of djay 2 iPhone and iPad, and now available in the App Store. djay and vjay have been updated to include support for Pioneer’s brand-new DDJ-WeGO2 DJ controller. The DDJ-WeGO2 comes with all the easy-to-use features of the original DDJ-WeGO, plus the ability to access and mix tracks using djay or vjay on you iPad or iPhone with the included Lightning™ cable. The Pioneer DDJ-WeGO2 is compatible with version 2.0.2 of djay 2 for iPad and djay 2 for iPhone, version 1.2.2 of vjay for iPad and vjay for iPhone, as well as djay for Mac version 4.2.1. We are thrilled to announce djay 2, the next generation of djay for iPad and iPhone. djay 2 introduces a groundbreaking new user interface that utilizes sliding layers to combine turntables, HD Waveforms™ and a drum machine into an intuitive, yet powerful all-in-one DJ system. HD Waveforms allow you to touch and interact with your music at an unprecedented level of detail and clarity, and provide precise visual cues that highlight similar sounds with similar colors. The all-new built-in sampler adds another dimension of creativity: trigger sounds and create drumbeats on top of your music using the pre-bundled sample packs, or sample your own music on the fly to create your own sample banks. The completely revamped music library makes finding and queuing songs in the iTunes library easier than ever before. Use intuitive swipe gestures to quickly build playlists based on song requests and upcoming tracks on the spot, or recreate a great mix using the new history playlist that automatically tracks played songs. djay 2 comes with cutting edge new analysis technology that lays the foundation for the new Perfect Sync™ feature, which ensures synced songs always stay beat-synchronized for a perfect transition or mash-up. A ton of other features and improvements like vinyl grooves rendered on djay’s virtual records to identify breaks in a song and the new Analyze Library feature which allows you to pre-analyze your entire music library. 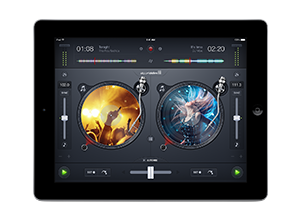 Learn more about djay 2, or get it now on the App Store for iPad and iPhone. We are excited to announce version 1.6.4 of djay for iPad and djay for iPhone – a free update now available on the App Store! Introducing Audiobus support: Now you can stream audio from djay directly to other Audiobus-compatible apps! Furthermore, vjay for iPad and vjay for iPhone have been updated with new features and enhancements. The free updates are available on the App Store right on your iPad, iPhone, or iPod touch, or via iTunes. We’re looking forward to your continued feedback via the djay Facebook page or @Algoriddim on Twitter. Today we released djay 4.2 for Mac, a free update for existing users of djay 4 with new features and a lot of improvements. djay 4.2 is a free update for all users of djay 4.
djay 4 is available exclusively via the Mac App Store for $19.99. We’re looking forward to your continued feedback via the djay Facebook page or @Algoriddim on Twitter.